I would like to dress my lvl 59 Burglar in all black clothing but the Torsos that I have tried always have something that won't change colour when I apply Black dye. Any ideas anyone? may be not possible to dye that one or is just an bug imo. Try to send an ticket when ingame to an GM maybe? what is the name of that item btw? if you're looking for medium armour, then no i don't think there is one that goes solid black. there's always a lining or something that stays its original colour. if you're happy to try a robe, try the robe of viisaus (spelling may be dodgy) which can be got from vol1 book 13 or from the store for a couple of hundred TP. i think it's the only armour piece that dyes solid black in the game, or at least one of only a few to do so. Thanks for the replies, I'll give them a try. 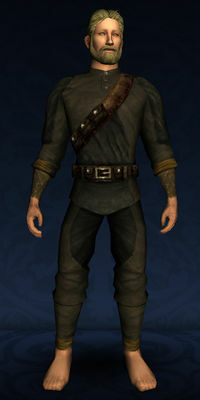 Rielthiere wrote: if you're looking for medium armour, then no i don't think there is one that goes solid black. there's always a lining or something that stays its original colour. This. But any of the burglar armour sets lv60 onwards dye very nice in black if it doesnt come as standard.